Beginning in the early 1890's numerous scientific, recreation, civic and commercial interests were making the case to Congress for the designation of Mount Rainier National Park. The designation was passed and signed into law in 1899. In the three decades before the designation recreationists and mountaineers had been exploring, vacationing and climbing Mount Rainier, most of whom traveled through Longmire and stayed Paradise Park. The history of the exploits and climbs of the mountaineers are recalled in the books about Mt. Rainier, and listed on the book resources Web page. Generally known but overlooked in these histories was a two-week expedition with a summit climb and overnight stay by a team of USGS geologists and others assigned to do a reconnaisance of the glaciers and geology of Mt. Rainier in July 1896. The goals of this series of Web pages are to present information, photos and materials which describe three aspects of that expedition. First, the timeline with dates and places of the expedition team. Second, the descriptions of what the glaciers and geology they saw, and reported, along the expedition, much of what they interpreted has since proven otherwise with later scientific explorations. Third, the photographs included in the report and others working in the area 1890-1900. In July 1896 three USGS geologists, Bailey Willis, Israel Cook Russell and George Otis Smith, were assigned to conduct a scientific expedition to explore and assess the glaciers and geology of Mount Rainier. They outfitted the expedition with a support team and supplies and set out from Carbonado with a pack animals to the terminus of the Carbon Glacier and establish a base camp at Philo Falls. After establishing the base camp and releasing the supply party back to Carbonado, the team set off on a exploration around Mount Rainier, including the first traverse of the alpine region on the north side of Mt. Rainier (above tree line). After a summit climb and overnight stay in the crater, the team descended to Paradise Park before returning along the east and north sides of the mountain to the camps, and back to Carbonado. The report of the expedition, the description of the trip, the glaciers and the rocks, was published in the 18th Annual Report of the US Geological Survey in 1898 with accompanying photos of scenes of and around Mount Rainier. The photos, taken in the 1890's by various photographers working around Mount Rainier and the area, were used for descriptive purposes than actual locations visited by the expedition. In the years before the expedition the USGS conducted forest resources field surveys of the area and after the expedition conducted traverse and triangulation surveys to produce the first topographic map of the new NP in 1915. Bailey Willis was involved in the interpretation and developement of the map from his long experience in the area. The expedition, forest survery and the map demonstrates the unsung work of the USGS in the area of Mt. Rainier and the National Park, which has continued to this day with work in volcanology, hydrology, glaciology, and natural harzards, more at the USGS Website. Numerous resources were used in the research for this set of Web pages, and the research is still being done to correct and improve the information. It's a living project and will be updated as I find new material and documents. To date these include the following primary sources, listed below, with the rest listed in the book resources Web page. "Glaciers of Mount Rainier", Israel Cook Russell, USGS Annual Report, 1896-97, Part II, pages 349-415. 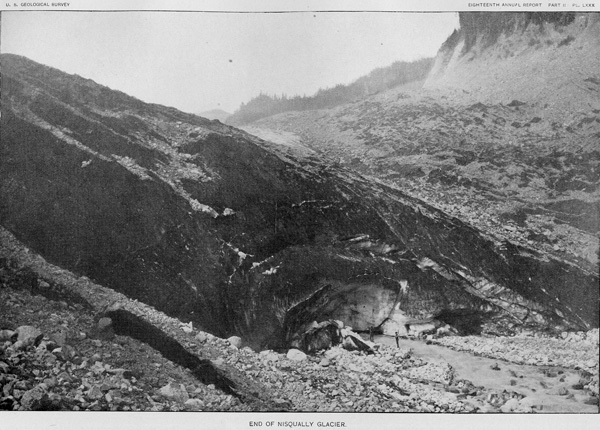 "The Rocks of Mount Rainier", George Otis Smith, USGS Annual Report, 1896-97, Part II, pages 416-423. "Impressions of Mount Rainier", Israel C. Russell, Scribner's Magazine, Volume 22, page 169-176, 1897. "Mount Rainer, A Record of Exploration", Edmond S. Meany, The MacMillan Company, 1916. "Among the Cliffs of the Northern Spine Mount Tacoma (Rainier)", Bailey Willis, unpublished essay, 1882. Field Notes of Geology and Rock Samples, George O. Smith, unpublished field book, USGS, July 1896. Personal Correspondence, Bailey Willis, Huntington Library, July and August 1896. "The Story of a Mountain", Arthur D. Martinson, The American West, Vol 8, No 2, 1971, pg. 34-41.